This is a fully customizable wall art piece modeled in full size scale after an F/A-18 Super Hornet. 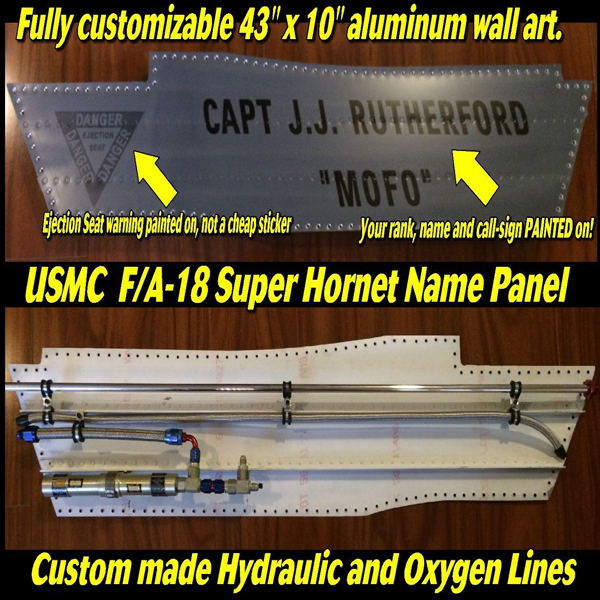 Pick your choice of Rank, Name and Call-Sign on a 43″ long, 10″ wide custom made .032″ 6061 heat treated 3/4 aluminum panel, complete with 100 flush rivets, another 130+ dimpled rivet holes (as if a crew chief drilled out the rivets for panel removal) with double L angle aluminum bracing and all kinds of Oxygen Lines + Hydraulic Lines and fittings. (fittings depend of what I have in stock, and what’s available at the three surplus stores that I collect materials from. I will always try to make each panel better than the last one). Due to the F/A-18 Super Hornet still being an operational front line aircraft,and classified, the size, shape and specifications of these panels is purely speculation. Choose the color of your aircraft, Port or Starboard side of aircraft, weather your DANGER Ejection Seat warnings are in Red and White or Low-Vis as on the pictured USMC panel. Each custom panel will take 2-7 days to complete due to painting and riveting being done after side of aircraft is selected. How about a “GOOSE” or “MAVERICK” or “SLIDER” or “VIPER” or “ICEMAN” panel for your wall? What would YOUR Call-Sign be if you were a Jet Pilot? Each panel will be one of a kind art for your wall, game room, bar, man-cave or as a gift for that Pilot you respect or that wanna-be pilot who never got to fly a 65 Million Dollar Aircraft. FREE shipping in the USA. F-14 F-15 F-16 and other aircraft panels will be available soon. Check out ‘Nose Art Displays’ on Facebook for more information.